Gabapentin (also marketed under brand name Neurontin(®)) is an anticonvulsant and pain relief medicine intended for the relief of neuropathy (nerve pain). It is also sometimes used for the treatment for seizures, but not usually as a primary means of treatment. Instead it is used for support. The drug is similar in structure to GABA, one of the chemical messengers found in the brain, but despite the similarity it does not appear to alter the functions of existing GABA and how exactly it works to prevent seizure activity is still not fully understood. In terms of pain it produces its effects by inhibiting the release of a type of neurotransmitter known as “glutamate”. Gabapentin can cause deficiencies in calcium, vitamin D, vitamin B1 and folate. Not only will this make your dog unwell, but because vitamins D and B1 are required for nerve repair, it can also put a dent in recovery. To prevent this, you should give your dog VitaCanine, a high quality multivitamin for dogs containing all of the essential vitamins and minerals mentioned above. 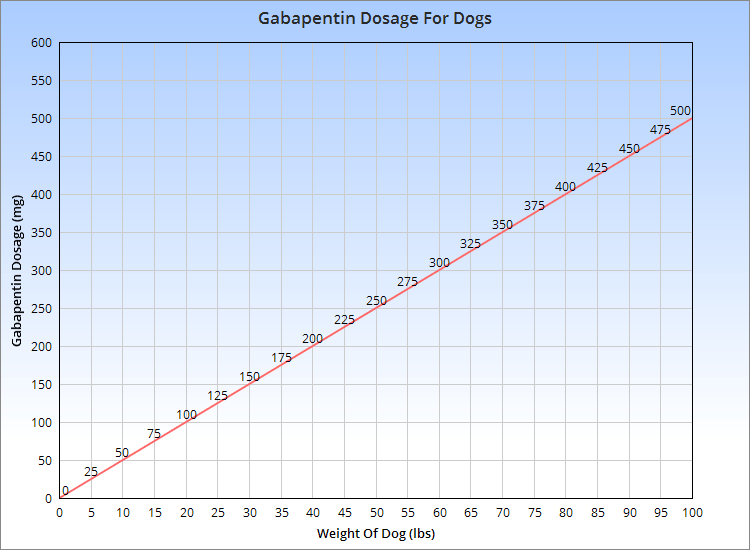 Gabapentin is administered to dogs in tablet or capsule form with the dosage for seizures typically being higher than the dosage used for pain relief. Always seek approval and an exact dosage plan from your vet before use. Do not administer liquid formulations intended for human use to your pet as these may contain high concentrations of xylitol. Xylitol is liver toxic when overdosed and in very high amounts (about 45 mg/lb) hypoglycemia can develop. For the treatment of pain a dose of 1.5 – 5 mg/lb can be given once daily (every 24 hours), but over time the frequency of dosing can increase to two or three times per day. Some vets prefer to administer a fixed daily dose of 75 mg to all sizes of dog, you should always stick to the vet’s recommendation. In most cases the dosage will begin on the lower end of the scale being increased gradually until symptoms are relieved. Because most dogs build a tolerance to the medicine after sustained periods of treatment it’s common for the standard dosage to become ineffective. When this happens a higher dose may be prescribed. For refractory seizures 5 – 13.6 mg/lb can be administered every 8 to 12 hours, with a limit of 1200 mg every 8 hours. Owners should be aware that treatment can get quite costly and its limited benefits may not warrant the expense. The chart and calculator below can be used to find the correct amount to give to a dog when using a dosage of 5 mg/lb. Your vet may alter the dosage based on your dog’s reaction to the drug and the improvement of symptoms. Do not abruptly stop treatment as this can cause severe seizures or pain depending on what the medicine was used for. Instead, gradually wean off over a period of three weeks. Example: A 50 lb dog might be given 250 mg three times daily for treating neuropathy. Gabapentin is considered safe and appears to cause few adverse effects apart from sedation and ataxia even when overdoses are administered. Owners should be aware that it increased the occurrence of pancreatic cancer in research mice, so you may wish to practice caution when treating breeds susceptible to this disease such as Airedale terriers, Spaniels and Boxers. Because the drug is removed by the kidneys it may also be unsuitable for dogs with kidney disease. In these cases a reduced dose can be used depending on the severity of impairment. Antacids, morphine and hydrocodone can all interact with gabapentin. Practice caution and notify the vet if your pet is taking any of these medicines. Gabapentin is not yet FDA-approved but is still commonly prescribed by vets for the management of seizures and nerve pain. Pregnancy/Nursing: Avoid use in pregnant animals and in nursing animals unless the benefits outweigh the risks. The drug passes through milk and has also been shown to cause fetal damage in high amounts. Remember to avoid the use of liquid formulations which contain xylitol. Also avoid giving your dog antacids for at least 2 hours before and after each dose. * Gabapentin is sometimes used as a secondary medicine in the treatment of arthritis. For this purpose it is given in conjunction with NSAIDs to increase their effectiveness. If the effects of this medicine are not adequate for your pet ask your vet about pregabalin.